Have you ever had a vision and knew without a doubt it was from God? But then fear told you getting there was not possible? Let’s say you saw a vision of you singing in front of hundreds or thousands of people. You are singing about His love, grace, and His mighty presence. You feel the anointing of the Holy Spirit in that place but once the vision ends, you realize you have never even been on a praise team before. How do you go from singing privately in your room to singing to thousands about Him? The enemy would love nothing more than to give us doubt and denial about what God has shown us. His goal for us is to not receive the entirety of the vision. Satan will also use lies such as; ‘Maybe what we saw is not exactly what the vision means’. This lie is to make us believe some visions may look too grand to attain. But we must never forget: Nothing is too grand for God. I have witnessed radical things happen through visions of what God was going to do in my marriage, with my children, in ministry, and with my Blog. Each vision gave me hope, faith, and encouragement to reach for what He has called for my life. By believing in the promises He gave me, lives were changed and healing was able to take place in many situations. A vision from the Lord does not only come as something you see, it also comes with a mighty rush of faith, a confirmation through the word of God, or a fierce determination that this is what God called us to do. It doesn’t come with covetous while others are growing toward their calling, but you feel stagnant. Nor does it come with envy as someone else’s position on the worship team came easier than it did for you. When we are looking at others, we waste our time. It takes our focus away and changes our prayer direction, fogging the clarity of the vision we were once given. A man once told me of a vision from when his children were young. He stood on a porch of a big home where trees and crop fields extended as far as he could see. Before the boundaries of the crops, in flourishing tall grass, he saw twelve grandchildren running. All his children were in the farmland with their hands on the plow. Each one pushing in sync with their spouse. I distinctly remember hearing his story fifteen years ago while all his children were merely in their teens. Today, this man’s children all know the Lord and work in ministry. All four children and twelve grandchildren go to church with him and his wife every Sunday. Witnessing this man’s testimony is beautiful. This man does not own acres upon acres of land, nor does he have a big home. Yet, because he has children and grandchildren serving the Lord alongside him, he is the richest man in the world. Throughout the years, discouragement may have occurred in the moments he wondered if his vision would come to pass. He could have coveted the experiences of others as their children gave their lives to the Lord, yet his own hadn’t. He kept his faith like the athlete who wanted to receive the prize. He sought God to keep himself focused on the example needed for his children. He sought clarity through prayer requesting a refreshing and renewing of the vision when discouragement threatened. Laying before God in prayer brings intimacy with Him. It’s when we request a revival of our visions and calling. And through this, He is faithful, bringing our focus back to Him. Today I challenge you to go before God. Ask Him to give you focus and clarity for what He has shown you. Ask Him where He wants you to grow. These questions are important as we work toward the visions. They enable trust in Him and in what He has in store for us. Through them, we receive a better understanding of where we are going as we learn and grow. My prayer today is that you fully receive what God has promised you and that you continuously seek clarity from Him. May clarity bring great revelation to the day of when the vision comes to pass so that you are able to fully comprehend the entirety of His will for your life. May you not seek after what you think the vision should bring, but that you seek after what God has called for your life. I am so excited to share with you this week a new friend, Emily Saxe of To Unearth. Her words in her post, The Difference Between Seeing And Perceiving Jesus: An Easter Story cut through the noise and lingered throughout the week. What is the difference between seeing and perceiving? And a step further … How do YOU perceive Jesus? “But there’s a beauty to this. Despite our lack of perceiving Jesus, He calls us by name. He desires to break through our cloud of distrust and confusion. He reaches out His scar-borne hands and breathes life through our name. 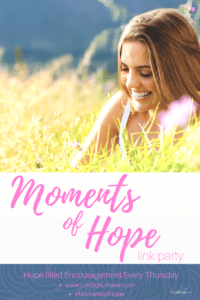 While you are there, please don’t forget to share some #MomentsofHope comment love ♥ And,Emily, please feel free to grab the Happily Featured Here button below! Focus and clarity — yes. We’re so scattered at times, and the state of our hearts bubbles into our prayer life as well. Yes and Amen to every word of this Carmen! Such rich truths mentioned here. Oh how the enemy likes to steal from us- before we even receive our vision. May we continue to press onward in BOLD FAITH toward our promises! Prayer is the funnel for our faith; when we pray we’re making a choice to believe God’s promises; to focus on His word and not the lies that feed our fears. We can even acknowledge our fears to Him in prayer, but we don’t stay there – because as we prayer we are empowered. It’s maybe instantaneous but our results, dreams will take time and in that time God continues to work. This was powerful and it really ministered to me. Thank you. “But we must never forget: Nothing is too grand for God.” Amen. It’s easy to underestimate God because we see OUR limits. 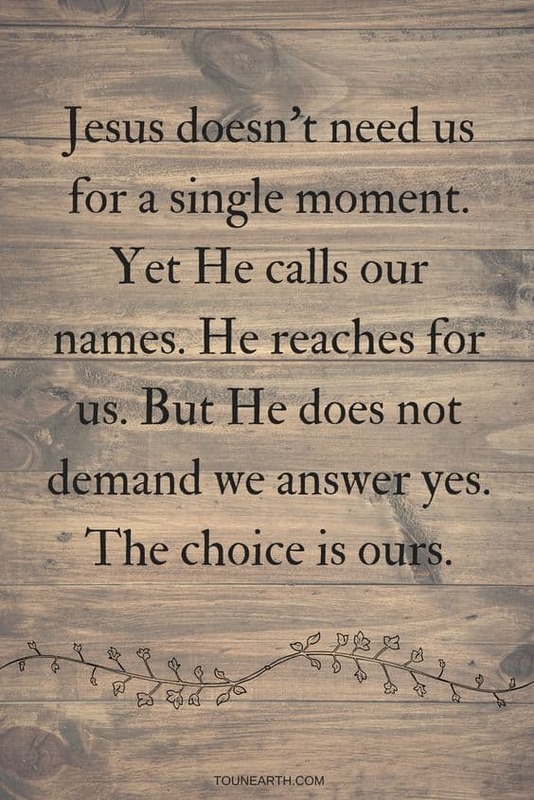 But thankfully, he is not limited by us. Thanks for sharing this! ‘But he kept praying’ – a simple, profound measure of the depth of our faith. May God increase my faith and give me eyes to see what He is calling me to. Thanks for the encouragement! This is such a great encouragement, we all have promises God has given us & yet the time for these visions tarry! Continuing to stand firm in those promises & the knowledge of Him & His timing in both bringing those promises to fruition & answering prayer is so very important. Carmen your words are beautiful and fill my heart! I love this story you shared and it makes me want to spend more time in prayer about what God speaks to me, all the more more. Thank you for being a faithful community encourager, that we put God first and learn to trust him no matter what. That we trust he has the vision in his hands. This post resonates with me, and gives my confirmation then I’m moving in the right direction. Thank you, Carmen! I really liked the direction you went with the focus and clarity by looking at what God has impressed on your heart. The enemy would like nothing more than to doubt what God has shown us and forget this vision He placed there. Thank you for the reminders to dream big and believe God for good things.